When setting out to help those experiencing homelessness people often think of donating a non-perishable food item, socks, or maybe toques and mitts. Rarely, though, do tampons come to mind. 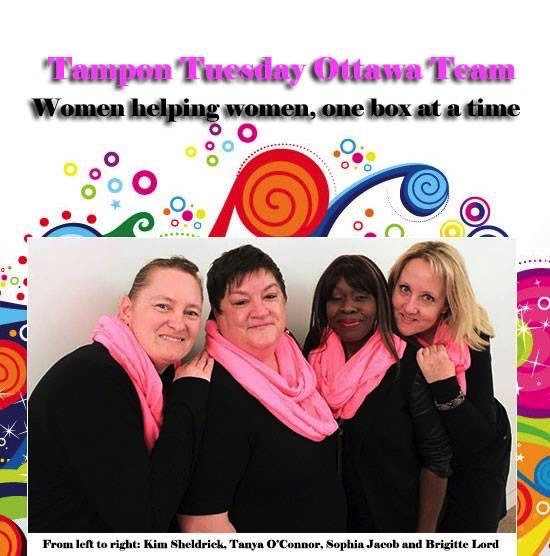 That is something that Tampon Tuesday Ottawa founders Brigitte, Kim, Sophia, and Tanya are trying to change. Two years ago these four women, who are now known as ‘Tampon Ambassadors’, decided to use their expertise in business, event planning, community development, and social media to create a campaign that provides tampons, pads, and incontinence supplies to shelters and drop-ins across Ottawa. They settled on an annual event in March to correspond with International Women’s Day. The event raises funds in order to purchase menstrual hygiene and incontinence products to then distribute to homelessness-serving organizations. For the Ambassadors, focusing on tampons and related products was obvious. The reality for people experiencing homelessness who menstruate is that tampons, pads and incontinence products are incredibly expensive. Those unable to purchase menstruation products must resort to homemade alternatives – balled up toilet paper, napkins, newspaper, or socks. These substitutes are unsanitary and leave people at risk of rashes and infections. In addition to health concerns, Brigitte expressed the driving force behind Tampon Tuesday Ottawa: “It’s about giving them some dignity”. Although sanitary products are a basic necessity for many people experiencing homelessness, they are an afterthought, with little awareness of the prohibitive cost, stress, and degradation that comes with not having the necessary products to manage a period and/or incontinence. This is where Tampon Tuesday Ottawa comes in. This March will see the third annual Tampon Tuesday Ottawa event. A local restaurant will host an evening of food, music, and performances, with a portion of the proceeds going to purchasing menstrual and incontinence products. There is a raffle, silent and online auctions, and corporate sponsors. Tampon Tuesday Ottawa has seen enormous success with over 150 people attending the one-night event. And the movement keeps growing. Last year a coupon-savvy volunteer donated a van load of tampons for donation. Recently, Venus Envy has come on board, providing an additional location for people to drop off sanitary products. The group would like to see more dedicated dropboxes installed throughout the city so that people can donate products year-round. Through its success, Tampon Tuesday Ottawa has been able to distribute menstrual products to various halfway houses, shelters, food banks, and drop-in centres throughout Ottawa. Brigitte says reaction from the organizations has been overwhelming. Donating sanitary products lightens the financial burden on the organizations, allowing them to use that money to buy food and other supplies. The Tampon Ambassadors have no intention of slowing down. As Sophia commented, “Working with these beautiful ladies has brought us closer as friends and closer to the community in an effort to help the women in our community. I love them and the work we do”. For them, making sure that people have access to the sanitary products they need is about health, safety, and dignity.